Carl Frampton and Scott Quigg pictured at Fridays weigh-in at the Manchester Arena ahead of Saturday nights World Super-Bantamweight unification clash. 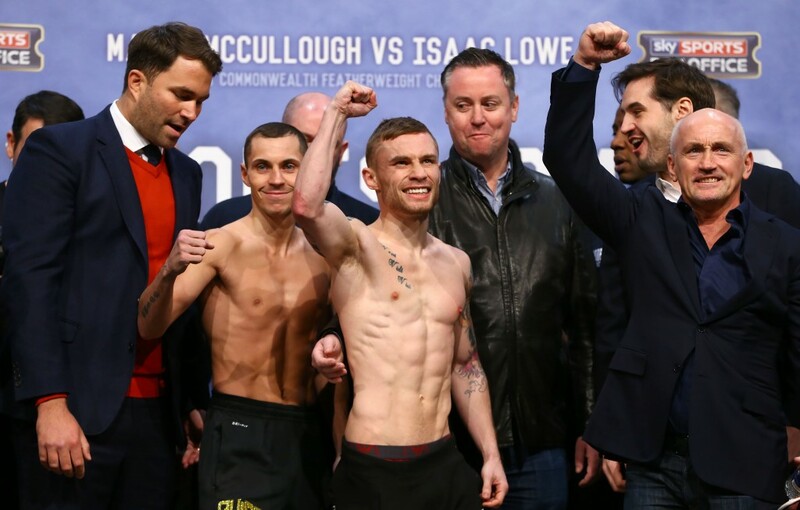 Carl Frampton and Scott Quigg both weighed in under the super-bantamweight limit of 122lbs today at a raucous Manchester Arena ahead of tomorrow night’s IBF and WBA unification clash. The North Belfast man was in buoyant mood and dispelled any fears that he was struggling to make weight, coming in as 121.6 lbs, one ounce heavier than Quigg. While such fights with the pay-per-view treatment have an element of manufactured rivalry, this is not the case here with genuine needle between the camps. Tensions almost boiled over before the boxers took to the scales with Quigg’s trainer, Joe Gallagher shoving Frampton’s chief second, Shane McGuigan. McGuigan looked like he was about to flatten the Mancunian as the decibel level scaled new heights. Despite this, the two boxers remained calm and both seemed to be thriving on the incredible atmosphere generated by the huge crowd with Frampton fans in fine voice while Quigg’s solution has been to hire a brass band to drown the travelling support out. It sets up a fascinating battle tomorrow evening with passions running so high and the Belfast favourite confirmed he is ready and raring to go. “It’s going to be unbelievable,” said Frampton as he stepped off the stage. “I’m used to big atmospheres, Quigg isn’t. “It’s something that might faze him, but we will see once the bell goes in the first round. That’s when we will be able to tell everything about him. I’m ready. I’ve wanted this fight for so long – five years. Both men took time after the length stare down to salute their fans and both seemed in good spirits but there was no doubting who had the greater support. All morning, Frampton fans made their way to the arena with his parents, Flo and Craig mingling amongst them and distributing tickets to supporters who were patiently waiting to enter the arena. Heavyweight champion, Tyson Fury received a great reception when he was introduced to the crowd by MC, Michael Buffer while Andy Lee – there to support his stablemate, Ryan Burnett – posed for photos with fans. As the fighters stepped onto the stage, the excitement grew and Frampton was in his usual incredible shape while Quigg was looking a little drawn, but that will change come fight night when both men have rehydrated. “This is the easiest I have made the weight. This week I did only three sweat sessions,” revealed ‘The Jackal’. “Everything is falling into my hands. They are still going nuts over the changing rooms. Joe Gallagher was going nuts on the stage. This is great. With fans flooding into Manchester, the big fight buzz is continuing to grow and promises to top anything that has gone before, not just around a Frampton fight, but boxing itself. “Quigg hired a band to drown them (fans) out but it didn’t work,” he noted.